I signed up to do this in a pair with Natalie Hawkrigg a few weeks ago thinking it would be good preparation for the Teenager With Altitude fell race the following weekend. I’d never done any kind of Mountain Marathon before and I assumed it would be less intense than a fell race, how wrong I was! I get really nervous before fell races and after much contemplation about why this is, I’ve come to the conclusion that it’s fear of pain. In order to feel satisfied with my performance at the end, it’s really got to hurt at the time. For some reason I thought the pace in the MMM would be a bit more relaxed, we’d be stopping a bit more and it would generally feel easier. However, Natalie is competitive, and with her plan of each of us taking turns to lead a checkpoint while the other plans the route to the next, all whilst on the move, we barely stopped at all and pushed hard at every moment. We decided to start by going the opposite way to all the other competitors but had to have a word with ourselves after wrongly identifying the southern side of the crag for the first checkpoint (clue: we should have used our compasses and not a vague sense of where south was). Things picked up after that when Natalie found a great line to our second checkpoint and I found a good line to the third one. We were moving well and swiftly found the next two before deciding to drop into Langstrath valley to pick up a 40 and a 50 pointer. These were found easily but the punishment was a huge slog back up to the higher fells to Long Crag on Greenup Edge. Thankfully we could see the kite well before we reached it which kept up the motivation. After that we hit the bitterly cold wind and both got battered looking for the next one. We decided not to go down into another valley at this point and headed towards Low White Stones where we intended to contour round to a “stream bend”. We took a compass bearing but completely ignored it and decided to follow a pair of men who looked like they knew where they were going (they didn’t). Annoyed and wind-frazzled we continued, only to realise that we didn’t have time to collect the next checkpoint we had intended so had to change tack. 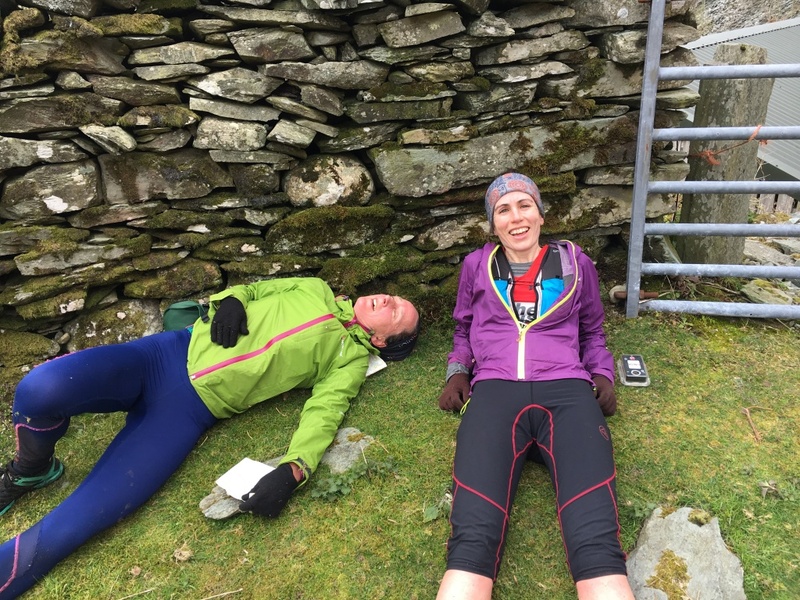 By this point we were both exhausted and had it been a fell race I would probably have slowed the pace and concentrated on just surviving until the end. This was not an option in this event, we had 24mins to get back, so suddenly, out of the pain, the bog and the frustration, I had to find another gear and increase the pace to get back in under 4hrs. We found time to hit one more checkpoint, abandoned plans for one more near the end and blasted down a steep descent that cut my legs to pieces. By this point my brain had also given up and I just trusted Natalie’s assertion that she knew the way. We blasted the last section along the road, I had cramp in my hamstrings (an unpleasant new experience) and we both thought we were going to expire, but we made it, dibbed for the last time then collapsed on the path in 3hrs 55mins. We scored 380 points in total and were feeling really pleased with ourselves until another ladies’ team came in and annihilated us with 547 points. Overall we ran 25.6km with 1692m ascent and if I’ve learnt nothing else, it’s to fear the pain of the Mountain Marathon as much as any fell race! Regardless, I will definitely be back for more.